Surrey Total Lawn Care Ltd offers lawn care in Guildford and is based in the heart of the Surrey hills, about 7 miles from the centre of Guildford. 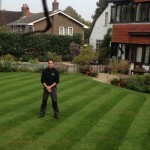 We have been maintaining lawns and grass cutting in Guildford and surrounding areas since 2006. Areas include, Merrow, Send, Jacobs Wells, Woodstreet Village, Milford, Shalford and Godalming. The soil tends to be chalk and sand in most areas in and around Guildford, and these soils suffer from drying out quickly in times of drought, this will stress the lawn and will often turn the grass brown. So lawns tend to need watering in the summer months if the rain doesn’t come. We at Surrey Total Lawn Care Ltd know that a good lawn care program will help to keep your lawns looking and feeling healthy. We are more than happy to pop to see your lawns and advise you in how we can help get the grass back to its former glory, and keep it that way. Surrey Total Lawn Care Ltd also offers grass cutting in and around the Guildford area, we can offer a weekly, fortnightly or perhaps you need a one off, or holiday grass cut. We are happy to help out if we can, so don’t be afraid to ask. We can cut any size lawn, so don’t hesitate to enquire. In autumn, it is very important to keep the leaves from laying on the lawn for too long, as this can promote disease and leave bald patches. We offer a leaf clearing and removal service in the autumn months. If you have any other questions,or need advice, then please contact us.